The majority of my posts have been covering the changes in London over the last 70 years, showing where London has changed, and the few locations where there has been very little change. Change in London is a constant, some good, some not so good and often we do not recognise and appreciate what we have in London until it is lost. For this week’s post I want to offer my personal view of a proposed very significant change to London and to the River Thames that now looks likely to get the go ahead and to be built. The Garden Bridge is a proposal to construct a pedestrian bridge over the River Thames between the Southbank and Temple Underground Station. As the name suggests, this will be far more than a simple pedestrian bridge, the deck of the bridge will be planted with trees, shrubs etc. to give the impression of a walk through a garden as you cross the River Thames. The proposal has already been granted planning permission by Lambeth Council and last Tuesday evening was granted permission by Westminster Council. The bridge will span the Thames, across the sweep of river known as Kings Reach between Waterloo and Blackfriars Bridges, from the Southbank to land on the roof of Temple Underground Station on the north bank. I am not going to argue against the concept, the design or the economics of the Garden Bridge, there are already a number of articles covering these topics. In this post I will question the location, and show what will be lost as a result of the Garden Bridge. The bridge will cross the river between Waterloo and Blackfriars Bridges. It needs to be high enough to provide sufficient clearance for river traffic at high tide, and the overall apparent height of the bridge will be increased by the planting of trees. The website of the Garden Bridge Trust can be found here where there are photos and videos of the bridge. The sweep of the Thames between these two bridges is one of the longest between Westminster and Tower bridges and provides superb views of the river from both north and south embankments and from Waterloo and Blackfriars Bridges. Rather than crossed by themed bridges, the River Thames and its relationship to the city and the built environment should be the object of interest. The River Thames is central to the history of London. It is the reason why London was established in this location. It was the artery which carried shipping to and from the rest of the world to the docks of London that were central to the development of London as a major global trading city. The Thames has also divided north and south London, providing two parts of the larger city with very different characters. The Thames also provides a key open space in a very congested city. The proposed landing point on the north bank of the Thames will be at Temple Underground Station. 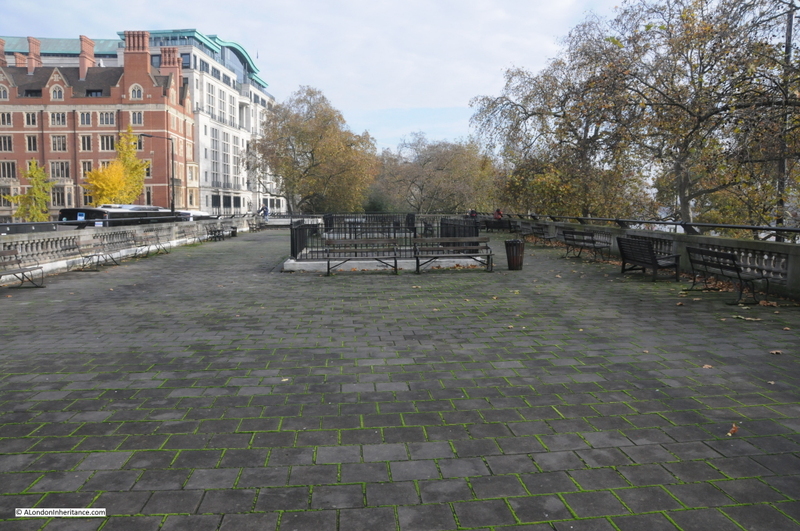 This is a relatively quiet area and the level of visitor numbers to the bridge (anticipated by the Garden Bridge Trust at 7.1 million per annum – paragraph 8.6.2 of the Environmental Statement Main Report Volume 1) will significantly impact and change this area. Last Saturday I took a walk round the area where the Garden Bridge is to be constructed to understand the impact and see how the area will change. I started on Waterloo Bridge, looking east down the Thames and across to the City. 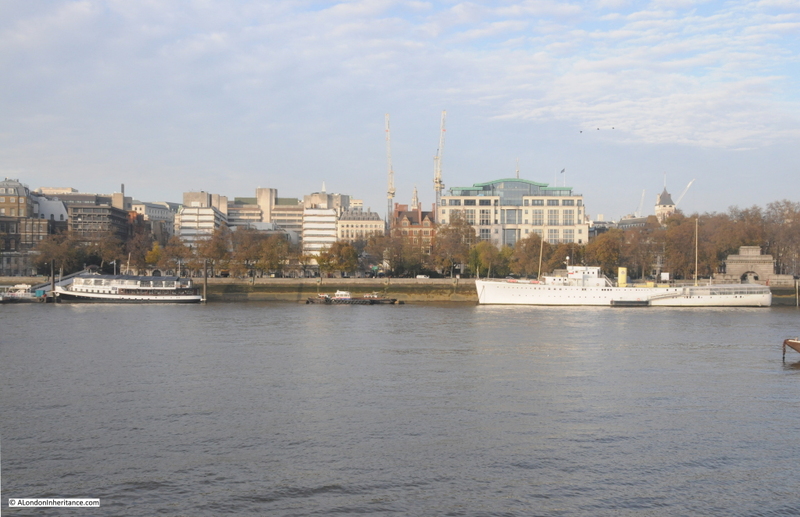 The current view is shown in the following photo, where we look down Kings Reach towards Blackfriars Bridge with St. Paul’s and the City in the background. The spire of St. Brides can seen above the trees on the left. The Garden Bridge will run across the centre of the river from in front of the white ship on the left to the south bank on the right. The long view of the sweep of the Thames will be lost with the bridge now running across the river and dividing Kings Reach in two, obscuring the view down to Blackfriars Bridge and having an impact on the view across to St. Paul’s and the City. 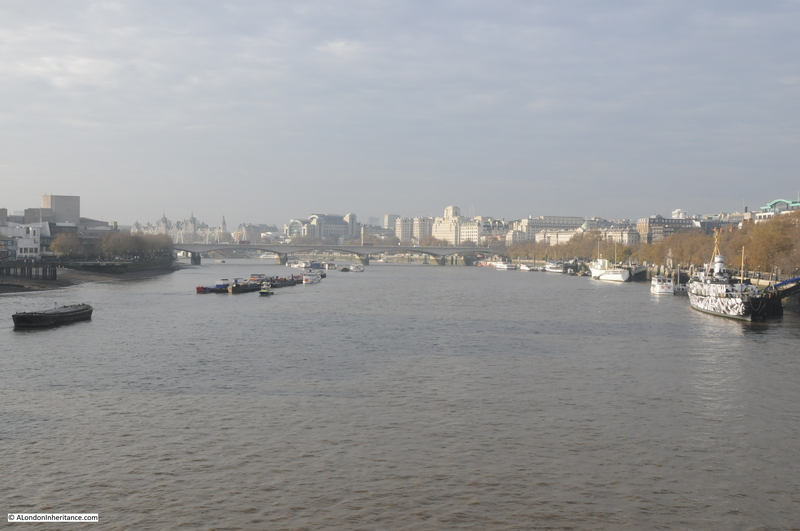 Walking along Waterloo Bridge to the north bank, we pass this view of the north bank of the river. This will change considerably as the bridge will be landing in front of the white ship and cutting across to Temple Station which is behind the trees on the left. 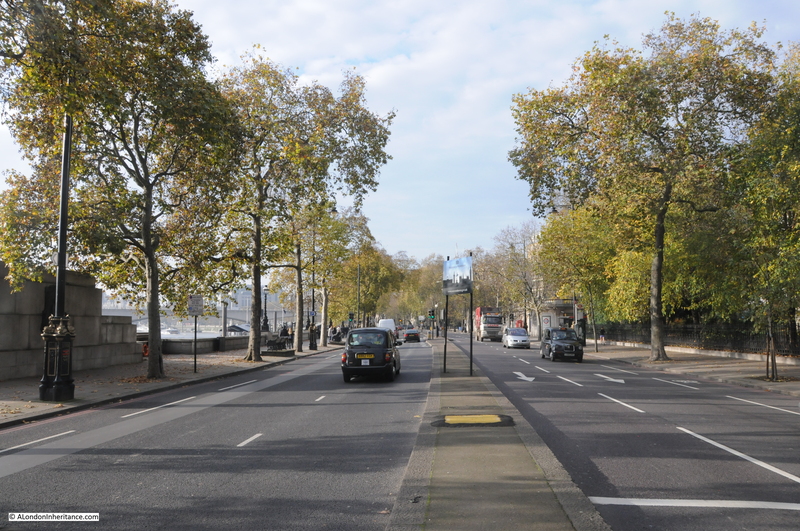 Compared to the south bank of the Thames, the north bank in this area (apart from the traffic) is still very quiet. The bridge will land on top of the building housing the Temple Underground Station, with steps running down to street level. In the following photo, the bridge will come across the gap between the station entrance and the railings to the right, with access ramps and two lifts onto the roof of the station and down to ground level. The rooftop area on top of the station and the adjacent bar is shown in the following photo. This will become the landing point for the northern side of the bridge. The following view is from the top of Temple Underground Station. The ship is the Head Quarters Ship (HQS) Wellington. 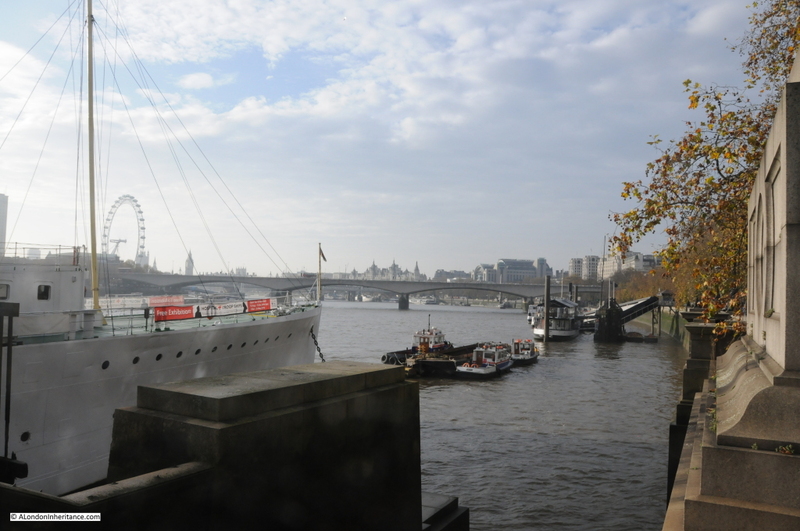 Built in 1934 and having seen service across the world, was berthed on the Embankment in 1948 as a floating livery hall of the Honourable Company of Master Mariners. The ship is now owned by a charitable trust, the Wellington Trust. The Garden Bridge will come across the Thames, in front of HQS Wellington and onto the Temple roof to the left. A view of the station entrance and building as it currently stands. Again, the bridge would be coming across the Embankment and landing on the roof of this building, with the associated steps and lifts to support the expected volume of visitors to the bridge. 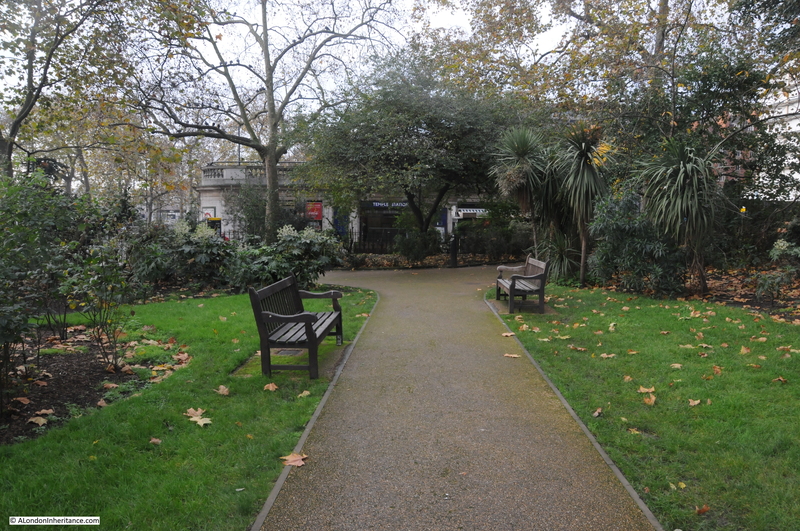 Adjacent to Temple Underground Station are one of the Embankment Gardens. 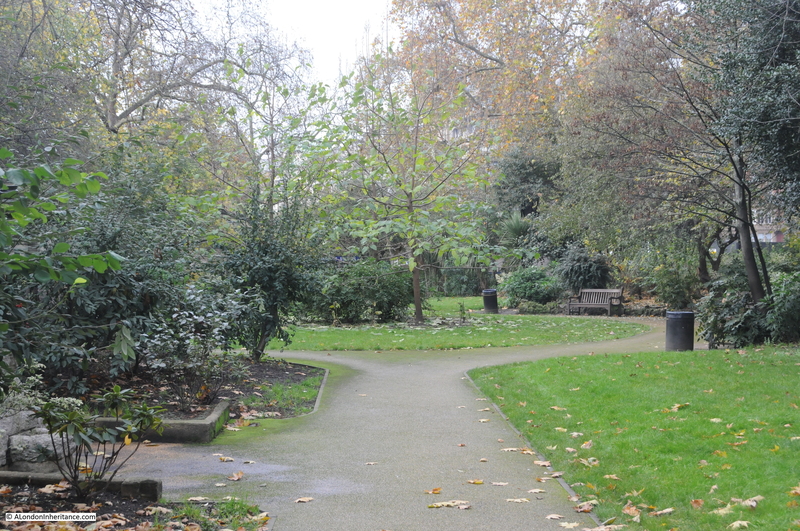 This garden currently provides a quiet area to walk and get away from the traffic on the Embankment. Remember that the Garden Bridge Trust anticipate 7.1 million annual visitors to the bridge. During peak periods there will probably need to be some method of crowd control / waiting for access to the bridge. 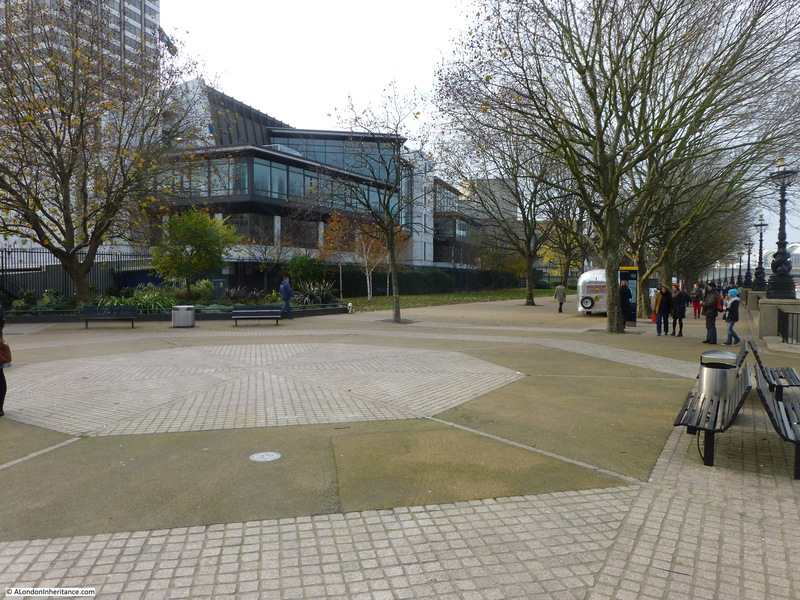 The impact on this garden and the area surrounding Temple Underground Station will be very significant, potentially making this area as busy as the Southbank is today. One of the arguments for the Garden Bridge appears to be that the Temple area is underused and the bridge will bring visitors, but I do not see why there is a need to make everywhere in London busy? One of the pleasures of living, working or visiting London is finding areas that are not crowded, not too commercialised and still having some unique character. 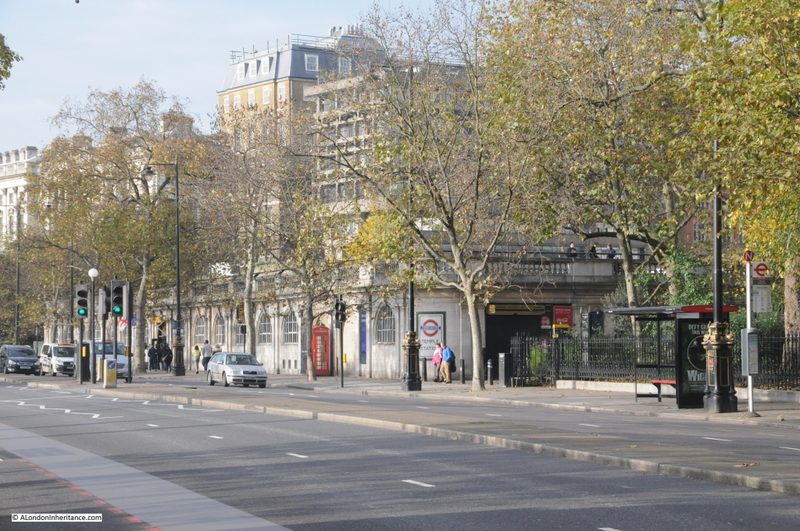 The Garden Bridge will significantly change this area of the north bank and bring significant numbers of people to the area around Temple Underground Station and the adjacent gardens, with the almost certain additional commercialisation that the availability of large numbers of people often attracts. These gardens have some interesting statues. 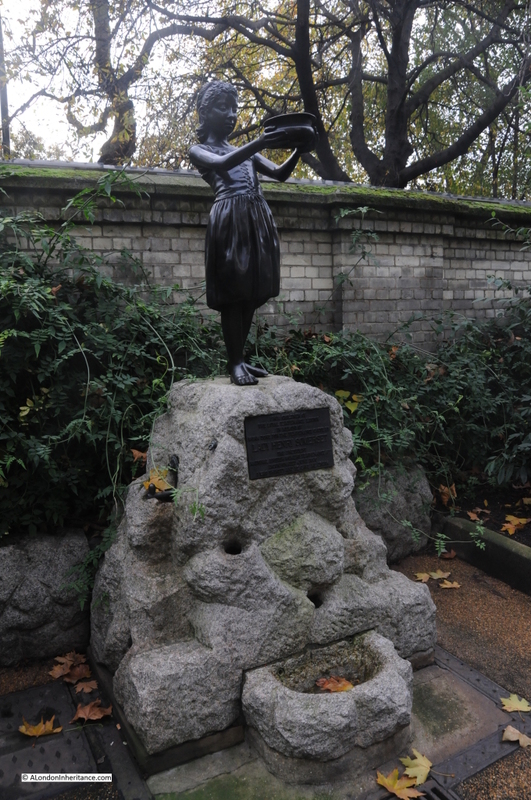 The statue in the gardens to Lady Isabelle Henry Somerset “in memory of work done for the temperance cause”, from the “Children of the Loyal Temperance Legion”. According to the plaque, she was also the founder of the first “industrial farm for inebriate women” whatever that could have been ! 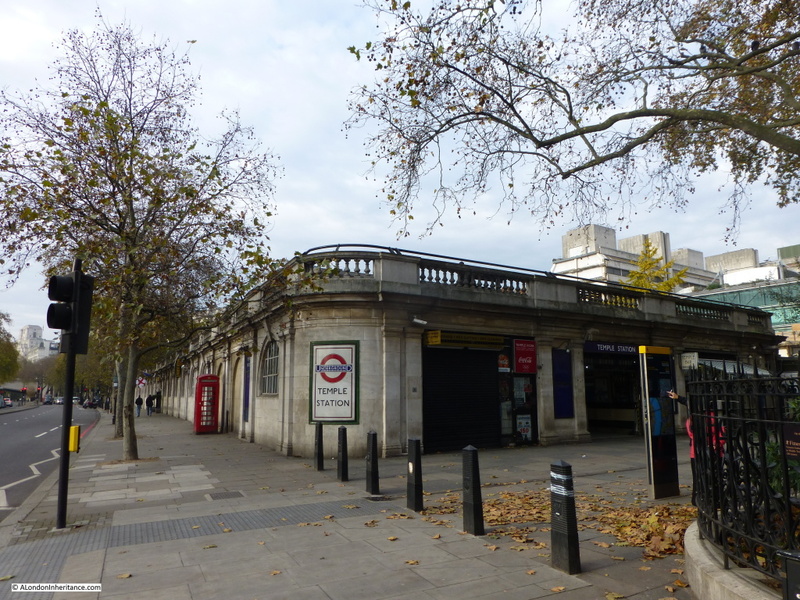 Walking along the Embankment towards Blackfriars Bridge we can look back at Temple Underground Station. 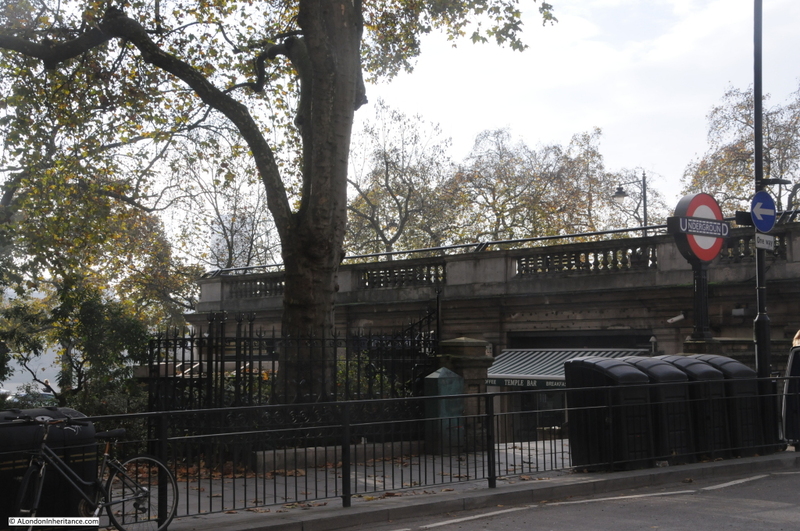 The Garden Bridge will cross the Embankment and land on the roof of the Underground Station. 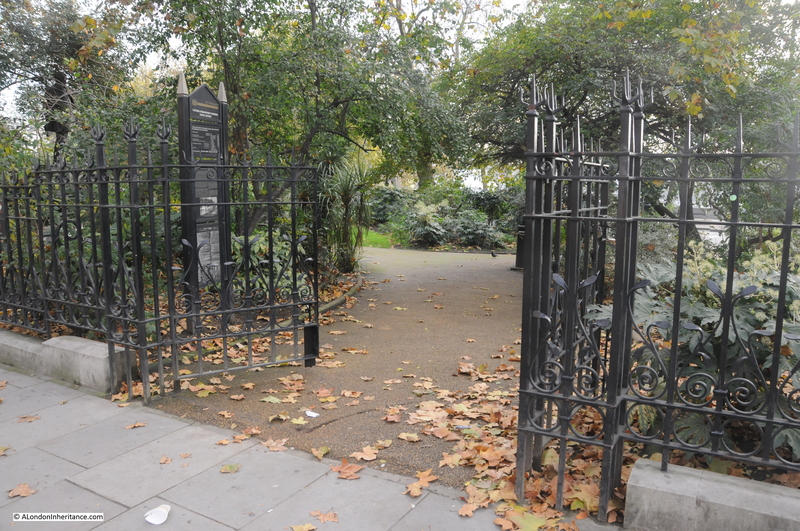 (If Westminster Council want to improve the area, it would be good to replace or remove the “Welcome to Westminster” sign in the central reservation, not the most inspiring of signs or integrated with the surroundings). Continuing along the Embankment, we walk up to Blackfriars Bridge and walk to the centre to look back up river to Waterloo Bridge. The first ship on the right is HMS President, painted in a “dazzle” colour scheme. Further along the north bank we can see HQS Wellington marking where the bridge will cross the Thames to the area with trees on the Southbank to the left. I doubt that very much of Waterloo Bridge will be visible and the planting on top of the bridge may well obscure the buildings running along the north bank. As well as the Garden Bridge, additional future development work is planned to take place for the Thames Tideway Tunnel on the Blackfriars Bridge foreshore where there will be reclamation of land in the foreshore and construction of a new permanent area with ” several ventilation columns, a kiosk and public realm furniture will be permanent above ground features”. See the Blackfriars site on the Thames Tideway Tunnel website here for an illustration. 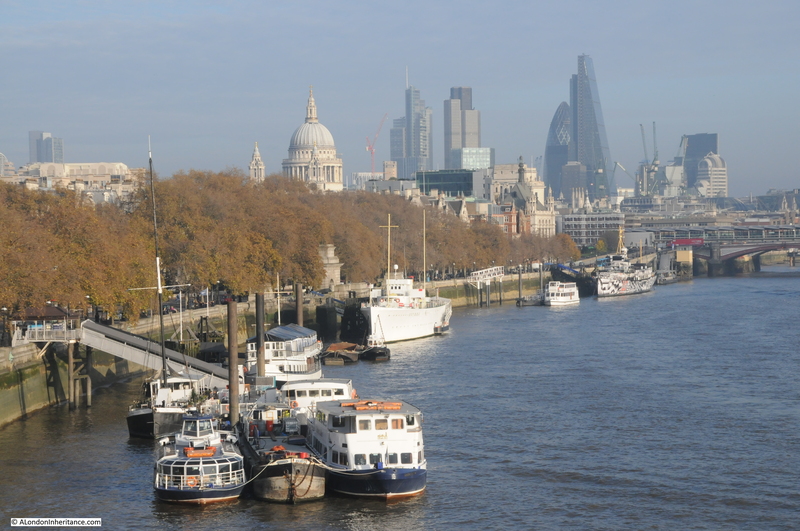 Continue across Blackfriars Bridge and walk along the Southbank towards Waterloo Bridge. Just past the Oxo Tower building, we pass Bernie Spain Gardens and arrive at the southerly landing point of the bridge, photographed early on a Saturday morning. In this area will be access to and from the bridge, along with a new building to house maintenance, storage and welfare facilities for the bridge staff and a combination of approximately 410 square meters of retail and/or restaurants and/or visitor centre / community / educational use. Walking a bit further along we come to where the bridge will cross the river. Looking directly across, the bridge will pass over the smaller boat in the middle of the photo, with Temple Underground Station being just behind the trees. To me, the Garden Bridge, however good the concept and design, will be in entirely the wrong location. 1. A significant stretch of the Thames will be changed for good. Kings Reach will be broken up into two smaller segments and the bridge will detract from the focus that should be on the river and the relationship between the river and the City. 2. Views from Waterloo Bridge and the Southbank will be changed for good, with significant loss of the view over to the City. 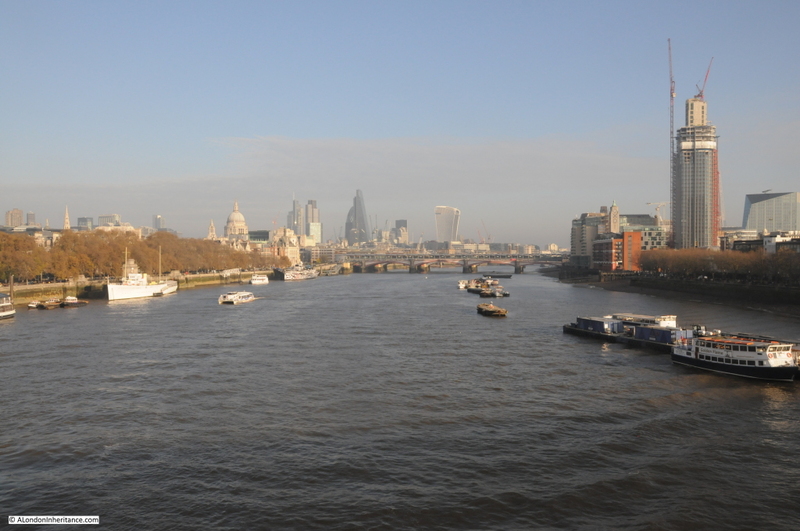 The view from Waterloo Bridge will now be of a much shorter stretch of the Thames. 3. 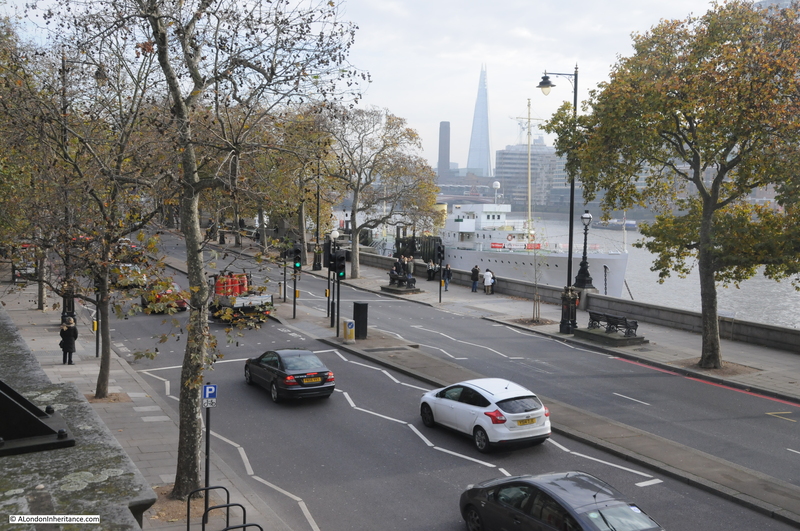 The view from Blackfriars Bridge will likewise change. The view of Waterloo Bridge and the arc of buildings along the north bank will be obscured. 4. A relatively quiet area of the north bank will be subjected to significantly raised numbers of visitors. The area will need to accommodate 7.1 million visitors per annum with the associated infrastructure and commercialisation that this number will attract. The current environment of the Temple will be changed for good. 5. The Southbank is already a very successful cultural and visitor location. It can be incredibly busy at weekends and during the peak summer periods. Can it cope with the additional visitor numbers that the Garden Bridge will bring? 6. Why in this location? What needs to be connected between these points on the south and north banks and what is the purpose of building the bridge in this location? The last bridge to be built in central London, the Millennium Bridge was for a very specific purpose, to connect Bankside and Tate Modern with the area around St. Paul’s. It is a well designed bridge built for the purpose of moving people, it does not pretend to be something else. Having received approval from both Lambeth and Westminster Councils, the final decision is now with the Mayor of London. 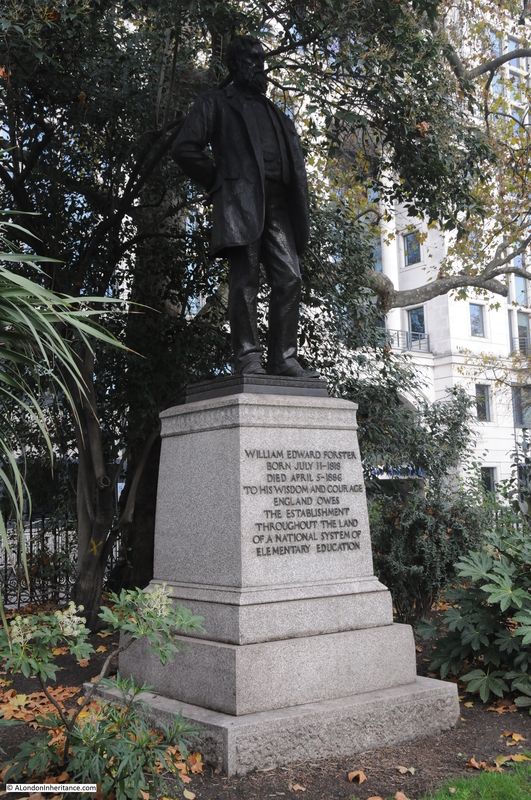 For further information, the site of the Garden Bridge Trust is here. Newspaper articles covering the recent decisions are from the Guardian, the Independent and the Daily Telegraph. This entry was posted in London Vistas, The Thames and tagged Garden Bridge, River Thames, Temple, Waterloo Bridge on December 7, 2014 by admin. Yet another well informed and interesting post. I totally agree with everything you have written here. Your images and observations are really valid. Have you sent this to Boris?! I think the whole idea is a misplacement of funds and the bridge doesn’t belong anywhere here at all. Other major cities, such as Rome, are not so keen to mix the old with the new. London is very quickly being transformed into Dubai. I will be writing about the bridge on my own site and linking back to this. Keep up the good work. Hi Jane, thanks for the feedback and your comments on Rome and Dubai are so right. Good post you have on the Walkie Talkie. My feelings exactly, towers over everything, both close up and from a distance. I will add a link from my post to yours when you have written about the bridge. Great post and a point well made. I agree with Jane, the London skyline is more and more resembling Dubai or a dozen other mega cities. London is being lost and replaced by a sanitised “London Heritage Experience”. I have to admit that I was completely unaware of this proposal until now (but I no longer live in London). “One of the arguments for the Garden Bridge appears to be that the Temple area is underused and the bridge will bring visitors, but I do not see why there is a need to make everywhere in London busy? ” I agree with this. Excellent points. As a frequent visitor/tourist in London, I have no use for the garden bridge. If Heatherwick, Lumley, et. al., are so keen to construct this, why not put it in East London, where it would be more useful to locals and visitors alike and where the impact wouldn’t be so devastating? Is there a petition or website where we can let Boris know what we think of this?